Delayed relief and rescue operations have infuriated the people living in different villages of Sindhupalchok district. The locals of Dhumthang VDC picketed a temporary helipad no sooner they saw a Nepal Army (NA) helicopter land there on Saturday evening, eight days after the devastating earthquake. 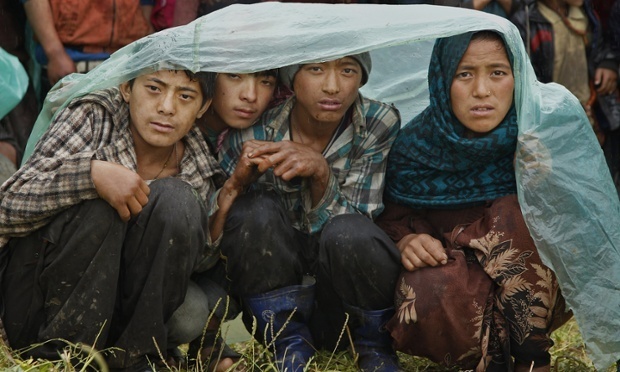 Their faces lit up with hopes that the chopper was carrying relief materials. But the hopes soon turned into anger when they realised the NA team was accompanying the journalists. Their fury was pacified only after the NA assured that it was there to rescue the injured villagers and fly them to Kathmandu, and a large helicopter carrying aid would arrive soon. The VDC is among the most affected in the district, with 87 casualties being reported so far and more than 300 injured. said Thule Kami, 58, sitting near the local football ground which has been turned into a temporary helipad. A majority of houses in Dhumthang have been reduced to ruins and the villagers are too scared to enter any house still standing. The frequent aftershocks are only compounding their problem. However, the landing of a 21-member army team led by Lt Sudhesh Bohara encouraged the villagers to venture into their homes for the first time in eight days to salvage their belongings from the rubble. The army estimates around 90 percent of the buildings in Sindhupalchok district have either collapsed or have been severely damaged due to the earthquake. All the public and historical properties, including schools and centuries-old gumba, lie in heaps of rubble. In the absence of any kinds of relief material, a majority of the villagers have been compelled to live out in the open with hardly anything to eat. “Thank god, the water supply was not destroyed by the quake. We have been living on roasted corn and water so far,” Kami added. According to Lt Bohara, the NA could not reach the place on time due to the lack of coordination. On Sunday alone, the army rescued about a dozen severely injured people and flew them to Kathmandu for treatment. “I don’t blame the army. It’s the duty of the local leaders, whom we have been voting for so many years, to help us during the crisis,” said Man Dhoj Sherpa, 75. “I see helicopters ferrying goods to Tatopani several times every day because the lawmaker from the area cares for his people. I wonder where is our representative hiding.” The villagers said though the government has claimed that it has released Rs 900,000 for each VDCs they have not received a single penny. The families of the deceased too are yet to receive compensation though the government has announced Rs 140,000 each to such families. Bohara said he had relayed the message to the Army Headquarters for the relief claiming that there would be needed supply.